Background: Conservative management of intertrochanteric femoral fracture often yields poor therapeutic outcomes, and surgical fixation is generally warranted. Biomechanical instability of intertrochanteric femoral fracture is a major cause of fixation failure. To increase the stability of intramedullary nails in intertrochanteric femoral fracture, it is critical to strengthen the support between the nail and the cortical bone. Our previously designed proximal femoral medial sustainable intramedullary nail has been proven to be able to provide this internal support and stabilization by finite element analysis. We aim to examine the efficacy and safety of internal fixation with this new type of intramedullary nail in the treatment of stable and unstable intertrochanteric femoral fractures. Methods/Design: This will be a single-center, two-arm, parallel, randomized controlled trial conducted at the Chinese PLA General Hospital, China. Seventy-two patients with stable or unstable intertrochanteric femoral fracture diagnosed according to AO/OTA Classification of Fractures and Dislocations will be randomly assigned to receive internal fixation either with proximal femoral medial sustainable intramedullary nails, or proximal femoral nail antirotation. The primary outcome measure will be bone healing condition 6 months postoperatively; secondary outcomes will be requirement for revision surgery, quality of life and complications 1 year postoperatively. Discussion: Our findings will provide an evidence base for the use of proximal femoral medial sustainable intramedullary nails for the treatment of intertrochanteric femoral fracture. Trial registration: ClinicalTrial.gov identifier: NCT01437176; registered on 1 September 2011. Ethics: This protocol was approved by Ethics Committee of Chinese PLA General Hospital of China (approval No. 07/06/2011) and will be performed in accordance with the Declaration of Helsinki formulated by the World Medical Association. Informed consent: Written informed consent will be obtained prior to involvement in the clinical trial. As society ages rapidly, the incidence of osteoporosis-related intertrochanteric femoral fracture is increasing. Intertrochanteric femoral fracture often results in severe bleeding, and treatment may be complicated by femoral head extrusion and lower limb deformity. Conservative treatment for proximal femoral fracture does not generally achieve good clinical outcomes, especially in the elderly, who are more likely to encounter complications (Jain et al., 2003). Consequently, surgical fixation is the preferred treatment; surgical intervention reportedly accelerates recovery and reduces the likelihood of complications that arise as a result of long-term bed rest (Bergeron et al., 2009). Internal fixation devices commonly used for intertrochanteric femoral fracture are mostly either extramedullary implants with a dynamic condylar screw (Crawford et al., 2006) and proximal femoral locking plate, or intramedullary implants such as the Gamma nail and proximal femoral nail antirotation (PFNA). It has been long discussed which method can achieve a better result. Recently, internal fixation with an intramedullary nail is becoming increasingly popular, particularly in the treatment of unstable intertrochanteric femoral fracture (de Vries et al., 2006; Kuzyk et al., 2009a). Internal fixation with an intramedullary nail is quicker, results in less perioperative trauma and blood loss, and provides stronger long-term biomechanical stability (Kuzyk et al., 2009b). If an intertrochanteric femoral fracture is unstable, internal fixation with an intramedullary nail provides sufficient biomechanical stability to allow early postoperative weight-bearing exercise (Simmermacher et al., 2008; Yli-Kyyny et al., 2012). Nonetheless, internal fixation with currently available intramedullary nails may be complicated by internal fixation failure and other implant-related complications, such as bending and segmentation of the intramedullary nail, coxa vara and femoral stem fracture; the failure rate is particularly high after fixation of severely comminuted and unstable intertrochanteric femoral fractures. The PFNA is a novel proximal femoral nail based on designs by the Association for Osteosynthesis/Association for the Study of Internal Fixation (AO/ASIF) and is used for the treatment of proximal femoral fractures; it provides strong anti-rotation and angle stability (Helwig et al., 2009). The system is characterized by the ability to apply cement through its helical perforated blade, increasing the tensile force for stabilization and avoiding rotation and inward collapse. In addition, distal inclined locking can reduce stress concentration and decrease the risk of distal fracture (Mereddy et al., 2009). Although the incidence of postoperative greater trochanteric pain syndrome after internal fixation with PFNA is reportedly as high as 10%, Pu et al. (2009) have suggested that this might be a consequence of the proximal femoral anatomy of Chinese people causing the screw to protrude from the greater trochanter. Unfortunately, screw withdrawal can exacerbate greater trochanteric pain syndrome, destabilize the biomechanical properties of the proximal femur, and cause avascular necrosis, malunion and refracture of the femoral head (Seral et al., 2004). Biomechanical instability is a major cause of fixation failure. The fixation stability of the intramedullary nail in intertrochanteric femoral fracture can be increased by strengthening the interaction between the intramedullary nail and the cortical bone. Our previously designed noval proximal femoral medial sustainable intramedullary nail has been proven to be able to provide internal support and stabilization, and would be expected to reduce screw cutting, femoral head rotation and the incidence of coxa vara. To the best of our knowledge, the efficacy of internal fixation of stable and unstable intertrochanteric femoral fracture with this new type of intramedullary nail has not been examined. 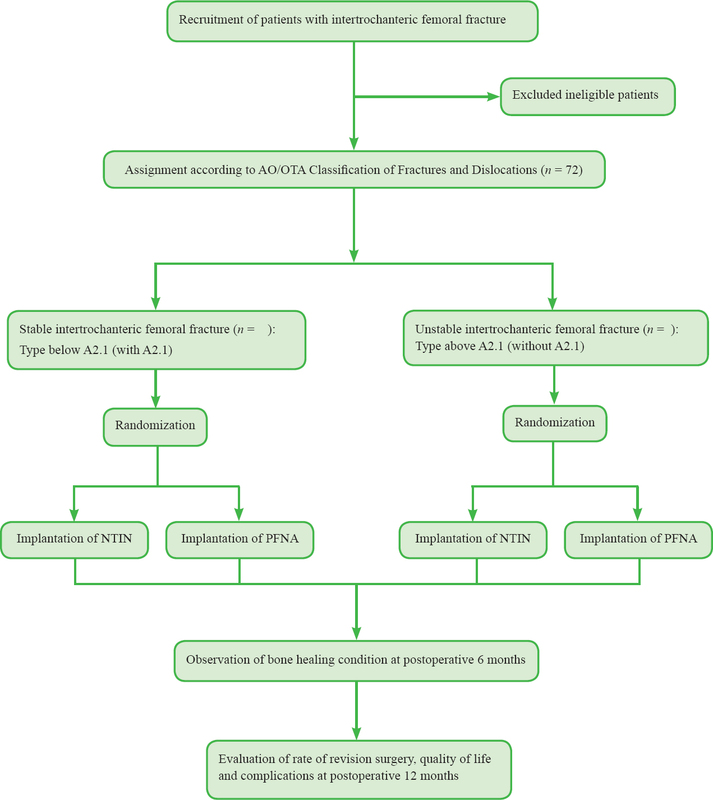 Here, we describe a study that will examine the efficacy and safety of internal fixation with this new type of intramedullary nail in the treatment of stable and unstable intertrochanteric femoral fracture. This will be a single-center, two-arm, parallel, randomized controlled trial. It will be performed at the Chinese People's Liberation Army (PLA) General Hospital, China. Seventy-two patients with stable or unstable intertrochanteric femoral fracture diagnosed according to the AO/OTA Classification of Fractures and Dislocations will be randomly assigned to undergo internal fixation with either a proximal femoral medial sustainable intramedullary nail or a PFNA. The primary outcome measure will be bone healing condition, assessed by X-ray, 6 months after surgery. The secondary outcome measures will be requirement for revision surgery, quality of life and complications arising 1 year after surgery. A flow chart of the trial protocol is shown in [Figure 1]. Note: NTIN: New-type intramedullary nail (i.e., proximal femoral medial sustainable intramedullary nail); PFNA: proximal femoral nail antirotation. Eligible patients with stable or unstable intertrochanteric femoral fracture will be recruited from the Division of Traumatic Disease, Department of Orthopedics, Chinese PLA General Hospital, China. Patients judged by the research team not to be suitable for participation due to difficulty with follow up, for example having no fixed address, plans to move away within the next year or intellectual impairment without adequate family support. According to the AO/OTA Classification of Fractures and Dislocations (Bosse et al., 2001), stable intertrochanteric femoral fracture is classified as below A2.1 (with 2.1) and unstable intertrochanteric femoral fracture as above A2.1 (without A2.1). Patients with either fracture type will be randomly assigned by a researcher using computerized randomization method to undergo internal fixation either with a PFNA or proximal femoral medial sustainable intramedullary nail, a new-type intramedullary nail (NTIN). The randomly generated numbers and assignments will be preserved in an opaque sealed envelope and will not be disclosed until eligible patients have agreed to participate in the trial. If any error or disclosure with regard to randomization occurs, a new randomization sequence will be generated starting from the problematic serial number and allocated to subsequent patients. Patients will be blinded to information regarding grouping and intervention, but the researcher responsible for surgery will know the grouping. According to the degree and direction of fracture displacement, the affected limb will be subject to skin traction and fixation in a neutral position. Anteroposterior radiographs of the pelvis and lateral radiographs of both hips will be taken to clarify the fracture type and measure the diameter of the contralateral medullary cavity to determine the diameter of the PFNA (Shandong Weigao Orthopedic Device Company Limited, Weihai, China) and the length of proximal and distal interlocking intramedullary nails. Prophylactic antibiotics will be administered 30 minutes before surgery. The patients will be positioned supine on an extension table with the capacity for lower limb traction. Under general or epidural anesthesia and after traction of the affected lower limb, the unaffected lower limb will be extended, abducted or subject to slight countertraction in abduction and extorsion. Closed traction and reduction will be performed under X-ray guidance. After reduction, a 3-6 cm longitudinal incision will be made above the vertex of the greater trochanter to expose the top of the greater trochanter. The PFNA entry point will be selected slightly lateral to the tip of the greater trochanter. The medullary canal will be opened, enlarging the entrance to facilitate the insertion of the thick tail of the PFNA ([Figure 2]). After a guide wire has been inserted into the medullary canal and its position confirmed by fluoroscopy (expansion of the medullary canal will not be undertaken in most patients with osteoporosis), a gunsight-equipped properly-sized PFNA blade will be slowly screwed into the proximal femoral medullary canal. The insertion depth and declination of the PFNA blade will then be adjusted. A guide pin will be inserted via the proximal locking pore of the gunsight. After the insertion position of the guide pin has been confirmed by fluoroscopy, a hole will be drilled to penetrate the lateral cortex using a cannulated drill along the guide pin. A properly sized screw blade held in an inserter will be impacted along the guide pin in an anticlockwise direction. The inserter will be rotated in a clockwise direction so that the screw blade compresses the fracture fragments, the screw blade will be locked, and generally a distal locking screw will be positioned. After satisfactory internal fixation is confirmed on fluoroscopy in the anteroposterior view, the end cap will be inserted. After irrigation of the surgical site, the skin will be closed with sutures. The implantation procedure of the NTIN (Shandong Weigao Orthopedic Device Company Limited, China; patent number ZL201020121021.6; [Figure 3]) will be similar to that of the PFNA, except that after positioning of the screw blade, the limit screw will be fastened to lock the sleeve, and the sustainable nail will be inserted through the guide sleeve and fastened. As for PFNA implantation, a distal screw will be inserted for static locking. Figure 3: Proximal femoral medial sustainable intramedullary nail (new-type intramedullary nail). Bone healing condition evaluated by X-ray examination 6 months after treatment. The timing of trial outcome measures is shown in [Table 1]. If patients exhibit severe adverse events, are potentially pregnant or subsequently fulfil any of the exclusion criteria after enrollment, researchers will determine whether the patient should be withdrawn from the trial according to their experience. Related data from these patients will be subject to intention-to-treat analysis unless patients request their data are discarded. The reason for trial withdrawal will be recorded in the case report form and medical case notes. If patients or their relatives decline to undergo follow-up, the patients will be withdrawn from the trial and data collected before withdrawal will only be included in the final analysis after acquiring informed consent. Upon the request of the researcher or patients due to safety concerns; patients who have no fixed address; those who report a plan to move away in the next year, or intellectually impaired patients without adequate family support. Any expected or unexpected adverse events will be recorded. The occurrence of complications and severe adverse events will be recorded as secondary endpoints. Expected complications include postoperative delayed femoral shaft fracture on the affected side, screw loosening, delayed union, malunion, bone nonunion and other related postoperative complications including secondary infection, pressure sores, venous thrombosis and pneumonia. If severe adverse events occur, detailed information of the adverse events including the date of occurrence, measures taken related to the treatment, causal relationship with the treatment and treatment of the adverse event will be declared to the researchers responsible for the trial and the ethics committee. Paper case report forms with complete information will be preserved in a secure locked environment for future viewing. Data will be input into an electronic database by professional staff using a double-data entry strategy. Conduct of the trial will be monitored by a professional research associate to ensure patient safety and data integrity; for example, it will be established that the correct consented procedure was undertaken, primary endpoints were evaluated and that patients were compliant. The research associate will have access to all essential documents. In addition to regular site visits, the research associate will liaise with the trial center via e-mail or telephone. Each patient will be allocated a unique trial number. Paper case report forms will be preserved in a secure and locked location in accordance with local data protection laws and regulations. During clinical visits, the research associate will check each patient's related data to ensure that data preservation is compliant with data protection laws and regulations, and to ensure data accuracy and integrity. All data will be analyzed by professionals using SPSS 15.0 software (SPPS Inc., Chicago, IL, USA). Classification variables will be expressed as proportions, and measurement data as the mean ± standard deviation. For general clinical data, the chi-square test will be used to compare numeration data between the two study groups, and Student's t-test will be used to compare measurement data. The paired t-test will be to compare individual patient's measurement before and after treatment. A P value < 0.05 will be considered statistically significant. The optimal surgical therapeutic strategy for intertrochanteric femoral fracture is still not known, particularly when cortical bone is deficient in the femoral neck (Schipper et al., 2004), but the NTIN appears to have substantial potential. In an antirotation intensity test, the blade of the PFNA holds the femoral head and neck, while the medial sustainable nail anchors the blade and the fracture fragments are reduced and fixed by a plane made by the locking bolt and locking screws, providing stability against antirotation. When reducing and fixing fracture fragments using NTIN medial sustainable nails, we believe that the plane of the nail affords even greater anti-rotatory properties (Han, 2014). We aim to inform the evidence base for the rational use of the proximal femoral medial sustainable intramedullary nail (NTIN) in the treatment of intertrochanteric femoral fracture. PFT conceived and designed this trial protocol. PBY and AHL helped to develop the study measures and analyses.JS wrote the paper. All authors approved the final version of this paper for publication. Bosse MJ, MacKenzie EJ, Kellam JF, Burgess AR, Webb LX, Swiontkowski MF, Sanders RW, Jones AL, McAndrew MP, Patterson BM, McCarthy ML, Cyril JK (2001) A prospective evaluation of the clinical utility of the lower-extremity injury-severity scores. J Bone Joint Surg Am 83-A:3-14. Crawford CH, Malkani AL, Cordray S, Roberts CS, Sligar W (2006) The trochanteric nail versus the sliding hip screw for intertrochanteric hip fractures: a review of 93 cases. J Trauma 60:325-328. Farivar SS, Cunningham WE, Hays RD (2007) Correlated physical and mental health summary scores for the SF-36 and SF-12 Health Survey, V.I. Health Qual Life Outcomes 5:54. Han L (2014) A biomechanical study comparing medial sustainable nail with proximal femoral nail antirotation (PFNA) for unstable intertrochanteric fractures. Tianjin, China: Nankai University. Kuzyk PR, Bhandari M, McKee MD, Russell TA, Schemitsch EH (2009a) Intramedullary versus extramedullary fixation for subtrochanteric femur fractures. J Orthop Trauma 23:465-470. Kuzyk PR, Lobo J, Whelan D, Zdero R, McKee MD, Schemitsch EH (2009b) Biomechanical evaluation of extramedullary versus intramedullary fixation for reverse obliquity intertrochanteric fractures. J Orthop Trauma 23:31-38. Pu JS, Liu L, Wang GL, Fang Y, Yang TF (2009) Results of the proximal femoral nail anti-rotation (PFNA) in elderly Chinese patients. Int Orthop 33:1441-1444. Schipper IB, Marti RK, vander Werken C (2004) Unstable trochanteric femoral fractures: extramedullary or intramedullary fixation. Review of literature. Injury 35:142-151. Seral B, García JM, Cegoñino J, Doblaré M, Seral F (2004) Finite element study of intramedullary osteosynthesis in the treatment of trochanteric fractures of the hip: Gamma and PFN. Injury 35:130-135. Shinar D, Gross CR, Bronstein KS, Licata-Gehr EE, Eden DT, Cabrera AR, Fishman IG, Roth AA, Barwick JA, Kunitz SC (1987) Reliability of the activities of daily living scale and its use in telephone interview. Arch Phys Med Rehabil 68:723-728. Simmermacher RK, Ljungqvist J, Bail H, Hockertz T, Vochteloo AJ, Ochs U, Werken Cv; AO-PFNA study group (2008) The new proximal femoral nail antirotation (PFNA) in daily practice: results of a multicentre clinical study. Injury 39:932-939. Stineman MG, Shea JA, Jette A, Tassoni CJ, Ottenbacher KJ, Fiedler R, Granger CV (1996) The Functional Independence Measure: tests of scaling assumptions, structure, and reliability across 20 diverse impairment categories. Arch Phys Med Rehabil 77:1101-1108. Yli-Kyyny TT, Sund R, Juntunen M, Salo JJ, Kröger HP (2012) Extra- and intramedullary implants for the treatment of pertrochanteric fractures -- results from a Finnish National Database Study of 14,915 patients. Injury 43:2156-2160.